Let me tell you something. I absolutely love fish. I love fish for the wonderful Omega-3 oils, but most importantly–I love fish for its taste. There are few smells better than the one of fried fish, which is then served with plenty of lemon zest. When I went to Amsterdam, I was dying to try fish “streetfood style” by eating it raw, in their market. And sure, you can find all sorts of herrings and small fish like hamsi–and yet, it wasn’t enough. I needed a challenge, something different. And that’s when I discovered a monster called halibut. Now it’s not a literal monster, but it’s a humongous fish! It’s a bottom-dwelling flatfish—literally a bottom feeder. It’s one of the largest, weighing up to 300 kg (about 661 pounds) and it can be as long as 2.5 meters (8 feet and 2.4 inches). Saying that the halibut is huge would be an understatement. And since we are talking facts, another interesting one is that they have both eyes on the upper side. 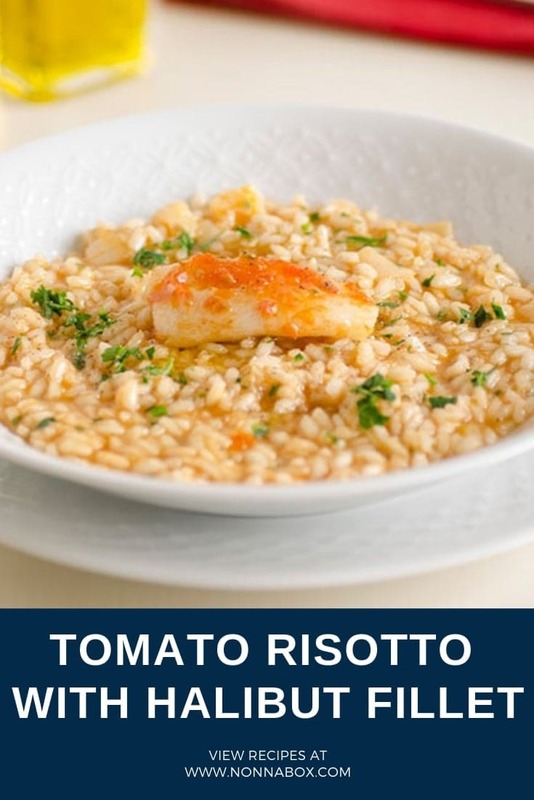 However, what makes the halibut stand out for me, turning it into the perfect choice for this tomato risotto with halibut fillet recipe is that it has a firm texture, blending perfectly with the risotto. Heat the pan with olive oil and brown the fillet on one side, then cook with a little tomato sauce. Cut little thin onion, cook in olive oil. Add the rice and toast over low heat, pour white wine. Add the fillet of halibut by taking small pieces for garnish. Add the tomato sauce and tomato paste. Continue cooking with vegetable broth (if you have the fish stock would be great!) stir constantly. Remove the risotto from heat, stir in olive oil, parsley, salt and lots of pepper. 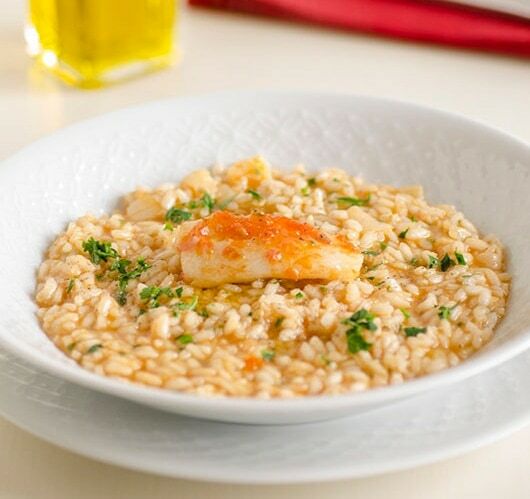 Arrange the risotto on the plates and recline over a small piece of fish fillet.